Some of the best signals generated by DLPAL DQ often hit their profit target during the same they are opened. Below is an example with a signal in TSLA and a new option added in the returns calculation tool for the next program update release. The high profitability of the portfolio backtest on Dow 30 stocks indicated a robust long signal. After the market open on Monday, the target of 2% was hit with the stock rising more than 3%. But afterwards, profit taking pulled the stock price down. In the last two days the stock has recovered near the Monday highs. We have added the option “Account for hit targets” to returns calculation in DLPAL DQ for accounting for hit targets during the next day after signal generation. Note that this function calculates only the next day return. If the target is hit during the next day, then that is accounted for in the calculations. Note that the same happened in the case of INTC. In fact, all stocks in the DLPAL DQ results generated a profit, as shown below. 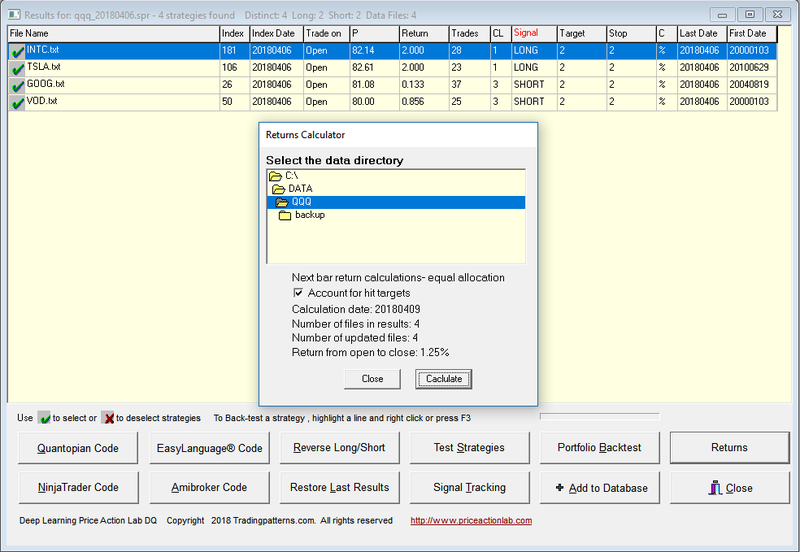 This new function to account for intraday target hits will be available in the next program release. This function is just for accounting purposes, it does not affect signal generation in the scan. For more articles about all DLPAL versions click here.